Water is a precious resource and we are constantly being told to conserve water. 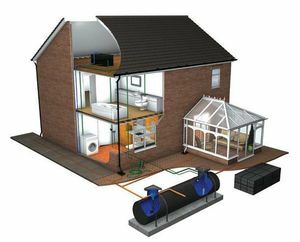 Rainwater harvesting systems collect rainwater from the roof of your home via guttering and downpipes, this water is filtered and then stored in a tank. The water collected can then be used to water gardens, wash cars, flush toilets and can even be connected to your washing machine. Water tanks can be installed above ground outside the property or below ground and they are suitable for both domestic and commercial use. The system can provide a direct feed system using a pump in the storage tank or gravity fed using a header tank.